I can’t believe India even exists in the same world of space and time as New York. At every turn I've been confronted by the confusing idiosyncrasies of Indian culture, and I've finally decided the only way I can possibly understand what is going on over here is to be simply reborn as an Indian. I chose India as my second stop for the usual reasons: become enlightened, do yoga, eat naan. I imagined feeling sublimely inspired as soon as I stepped off the plane and took a deep breath of that subtropical air. As it happened, the first thing I felt was sheer dismay. I took a cab from the airport to my hotel and in that time I saw a kid projectile vomiting out of the window of a crowded bus while his mother calmly looked on, a grown man nonchalantly throwing empty liter soda bottles and chip bags out of the window of his car right into the grassy highway median, and cars veering centimeters from one another, honking enthusiastically and often, ignoring any lines demarcating lanes. The thick smog in Delhi hit me immediately and I picked up a nasty cough that didn’t go away until I was miles away from any city in the countryside. I balked against all of it. Nothing is on time, four hour journeys turn into seven hours, hygiene is nonexistent, showers are buckets of water, mattresses are Styrofoam pads, everything has refined oil and milk solids in it, locals throw rocks at puppies, whip their cows, stare you down for having white skin and take sneaky pictures of you with their cell phones, there are mountains of plastic and trash like you can’t even imagine EVERYWHERE. Windows and walls are so thin that you can hear the burping and hocking of every person in the building (noises which are accepted, if not encouraged), along with the ceaseless honking, diesel engines, and howling dogs from the street. The advice that I received fairly early on, and the advice that I now pass on to all of you if you ever plan to visit India, is to just give in. You have to forget about the past, and forget about the future, and forget about things going according to plan. You have to forget what planning even is. Forget about your manners and your social cues and cleanliness and comfort. Only when I put aside everything I knew to be true about life was I was able to be at peace with my new reality in India - apart from the endless penetrating stares and requests for pictures. I will never be comfortable with that kind of attention and what feels to me like racism. You have to have a great deal of self-confidence, which I don't have, or alternatively, no ego at all, which I don't not have, to normally go about your errands with an entire village staring at you. That being said, I didn't think I had much patience either (you don't learn anything about having patience in New York), but after some time I started successfully responding to delays and setbacks with nary but an amused shrug. I practiced sitting around and waiting. After touring some of the most spiritual sites in the Himalayan foothills, and consequently beating myself up for not having a full Beatles-in-Rishikesh divine personal enlightenment, for not doing yoga and not meditating LIKE I SHOULD BE DOING IN INDIA, I flew to the center of the country to volunteer at the International Permaculture Convergence in Telangana. This landed me on a huge farm in the middle of nowhere (nowhere being massive cotton fields where local workers file in everyday, cows in tow, to pick the blossoming white tufts with their hands for the world market), made up of large swaths of hostile, dry land and pockets of lush garden, seeded and nurtured by the volunteers who arrived before me. It was like walking into the den of the Lost Boys in Neverland – people my age from all over the world were running the show, wrapped in gauzy dhotis with handhewn leather belts boasting crude knives and rusting scythes, feathers sticking out of their caps, living in shade shelters fashioned from billowing saris, palm leaves, and coconut rope. They had created everything that supported me in my month and a half on the farm – the showers, the toilets, the gardens, the public spaces. I never once saw the owner of the property step foot in our village nor the vegetable patches – she remained lovely and somewhat cold, gliding in her gleaming white kurta between the dining hall and the permanent residence, called “the castle”, at the foot of the property. 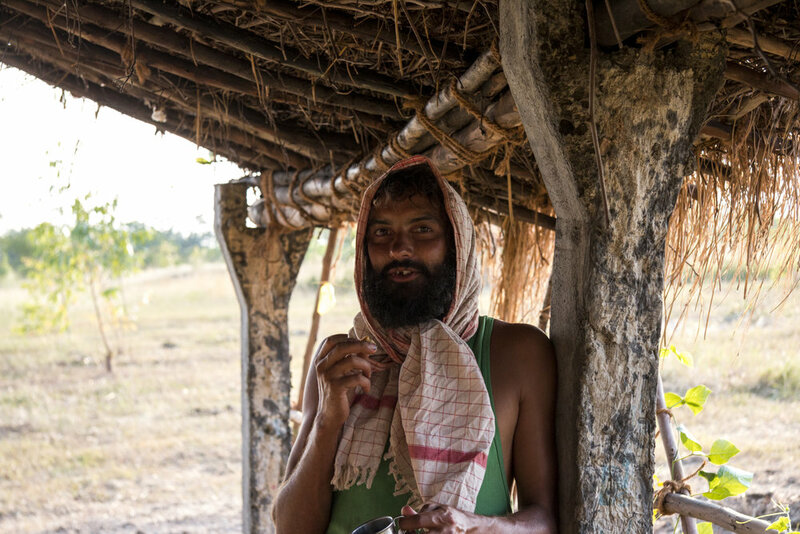 The man hosting the convergence, a respected Indian permaculturist with a beautiful ecovillage of his own, showed up maybe once before the event itself. Bureaucratically, the experience was a horrifying mess – I saw friends get seriously ill and shamefully exploited. There were rumors and untruths and misinformation and secrets. I was still on the farm after the event ended, when teams of workers came in and unceremoniously tore down everything the volunteers had soulfully and achingly built. But it was on that farm that the divine things that I expected to learn in India manifested. I slept in a tent for the first time in my life and watched the sun set and the moon rise every single evening. I made up my own constellations, Big Kite and Little Kite, from the thousands of stars in the sky above my head (stargazing is particularly extraordinary to me because you can’t see stars in New York). I picked spinach, mustard and fenugreek and ate them as handfuls of salad, and cooked peanuts and oatmeal and bread and jam over roaring campfires built with coconut husk and eucalyptus sticks. I built my own fires! I seeded coriander and amaranth, tucking them gently into the soil with compost, and then watched them grow. I hid from the relentless sun at midday and was scoped out by curious flies and giant wasps. I was the recipient of shocking amounts of kindness over and over again. Even when I didn’t feel like sharing, my friends shared with me. Wisdom was handed down and insights were organic. Why am I still surprised when reality turns out to be completely different from expectation (and always, much sweeter, it its own crushingly realistic way)? It happens every single time. I don’t know why I even still form expectations. There is no point. Especially not in this country. On the farm, there were no gurus, no schools, no temples, no famed spiritual sites. There were just plants and people. I was coached on being mindful and present, while mulching baby trees and getting covered in thorns, from my partner in the garden. I learned how to bandage the horrifying wounds of the farm dogs, who kept coming back to us after fights, from one of the guys I built my campsite with. My friends pointed out constellations, made flutes out of plumbing pipes, treated each others’ lesions with crushed up herbs, and built a regenerative system of lodging, sanitation and agriculture to support an international gathering of a thousand people. I remember when I arrived at the farm I was so envious of how scrappy the volunteers were, as I watched them easily build fires to roast coffee and peanuts. When I left the farm, I was doing just that - because they showed me how. 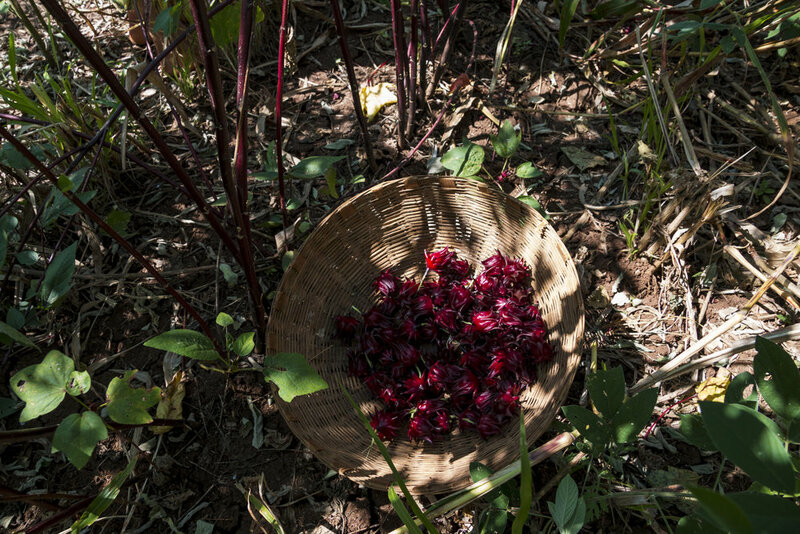 Rosella, also called roselle, wild hibiscus, or Jamaican sorrel, might be a hard ingredient to find, but not impossible. It grows like a weed on the farm, red buds bursting everywhere. When you cook rosella petals down, they gel up, so this jam does not require any thickener or pectin. Whole, raw cranberries might work as a substitution here. I kept my jam purposefully on the sour side, as I knew I would be serving it with the sweet Osmania biscuits (a very thick shortbread cookie) that the volunteers always had on hand. You can add sugar to taste if the jam is not sweet enough for you. Combine rosella petals and sugar in a medium saucepan over medium heat. Cook down for about 10 minutes, stirring constantly. If the mixture starts to burn, turn down the heat. Add the cinnamon sticks, and continue to cook for another 10 minutes, still stirring constantly. When mixture has reduced to about a third the size and is jammy, remove from heat and let cool. Transfer to jar and enjoy with something sweet! The flavor of this jam deepens with time and is best served the next day and beyond. Jam will stay good for weeks if kept in the fridge.